PlusD creates a decentralised transaction protocol and ecosystem for data exchange and contract automation along the Supply Chain. 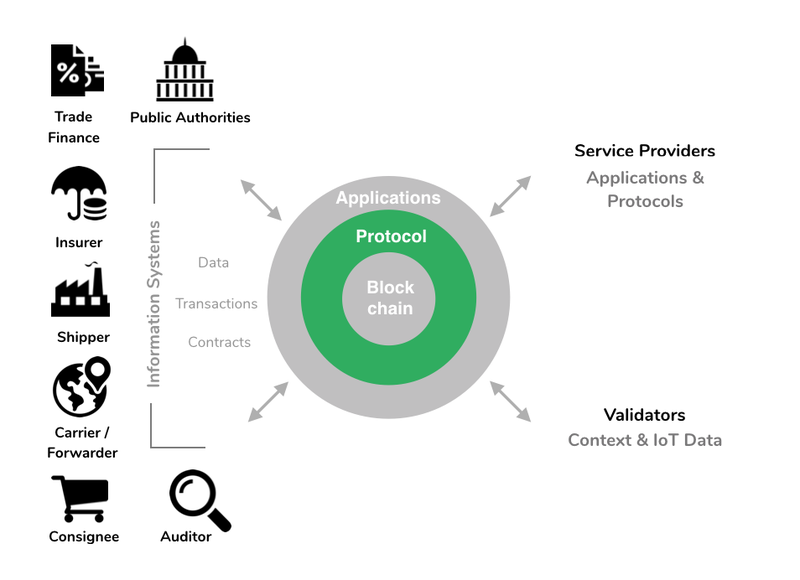 The protocol acts as a value-added glue between the blockchain layer and user facing APPs. It implements Interoperability and data reliability services, and simplifies the development of applications. PlusD believes that the contract between the different protagonists (e.g. insurer, carrier, shipper) contains all information needed to connect and automate the complex processes of the widely fragmented logistics ecosystem. Therefore, all of +D pilots focus primarily on the digitisation of the contract interactions between the different partners incl. contract negotiation, condition tracking, conditional settlement). The following visualisation shows the process flow tested in the first +D pilot. The in the pilots generated data specifications and process descriptions will then be integrated into the protocol layer and usable by open sdks for different platforms and systems, which allow the involved players to create tailored solutions for their supply chains.